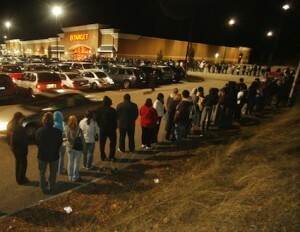 For some people, Black Friday is a magical time of year. For others, it might be a source of confusion. Contrary to the connotation of the name, it does not refer to some massacre that took place or something race related but instead is popularly held as the day businesses return to profitability, or the black (as opposed to the red). Simply put, Black Friday is all about the shopping. You might be wondering what this has to do with traveling, particularly if you are not American, and while this isn’t an actual holiday but just something that has come about due to the day before (Thanksgiving) being a day off, it is quite significant to the traveling community. How you ask? Let me explain. The shopping deals in place on Black Friday are often so ridiculous that it is worth planning a trip to a major U.S. centre just to take advantage of them. Everything from 2 for 1 electronic deals to half price clothing and everything in between can be worked in. People line up the night before just to be among the stampede that gets inside first to get that coveted toy or deal that there is limited supply of. If you aren’t in the market for anything or if you’re simply a foreigner in America that day, it’s worth it just to watch the madness ensue. Canadians have been known to make the trek to the U.S. in droves to take advantage of the deals, even at the risk of being busted by the customs agents for bringing back more than they are allowed without paying duty on it. In recent years, Canadian retailers have offered their own deals to try and keep shoppers from going to the U.S. and while they have made significant inroads, it is still a far cry from the madness south of the border. Black Friday is America’s running of the bulls, both because it’s a literal stampede and because it makes observers wonder why anyone would take part in it, especially when many retailers extend the savings to include the entire week leading up to or following the actual day. Even for Americans themselves travelling hours away, spending the night in a hotel for the weekend to take advantage of the deals has become its own tradition, often overshadowing Thanksgiving in cultural significance. Love it or hate it, consumerism is a major part of American culture and to bear witness to Black Friday is to experience what it is to be American. So if your ideal travel situation involves shopping for deals amongst hordes of people, get to a mall or electronics mega store in the U.S. on the day after Thanksgiving. You may score an unbelievable deal or at the very least be entertained.